Automatic use of SMTP TLS with recipients that support it provides seamless automatic encryption between sender and recipient which looks and works like regular email. Not all recipients support TLS, but for those who do (e.g. all your internal LuxSci users and some of your correspondents), secure email with TLS is automatic. For cases where TLS is not an option, SecureLineTM will fall back to Escrow — storing the message securely and sending a notice to the recipient to come pick it up. Escrow works for any recipient, no matter what email system s/he may have and no setup on the part of the sender or recipient is required — it just works. If you are using some of the more advanced SecureLineTM options, such as Certificates or Escrow with Questions and Answers, it is often convenient to have a central location for all of the recipient public keys and/or questions and answers — a place all of your users can automatically use when they are sending. Using shared address books makes it easier to have a central location of recipient information accessible to all users. Personal, domain-wide, and account-wide global default Escrow questions and answers makes it a snap to send secure email messages to anyone you like using a single pre-defined question. With SecureLineTM, you don't have to worry about encryption software. Simply enable automatic outbound email encryption and you're all set! SecureLineTM can auto-encrypt messages to all recipients, determining if TLS, Escrow, or PKI should be used in each case. If automatic outbound encryption is enabled, users can determine what happens to messages that cannot be encrypted*; these messages can be sent normally, or refused with notifications going back to the sender. Users can choose to have SecureLineTM auto-decrypt PGP and S/MIME messages as they arrive so that messages can be filtered and stored in an unencrypted format in their email folders. Using secure POP or IMAP, the recipient can then access the message safely in any email client. *The only case where some messages may not be able to be automatically encrypted is when you are using the Question and Answer mode of SecureLineTM escrow and do not have questions for everyone or default questions configured. With SecureLineTM you don't have to learn a whole new set of tools or way to access your email. It's all there, wherever you are. All SecureLineTM features are integrated with LuxSci WebMail, so users can send and view secure messages from anywhere they have access to the Internet, using the same familiar tools for composing and viewing email messages. Users can send encrypted messages from any email client connected to LuxSci via our secure SMTP services or via Mobile Sync. Users can easily send a single message securely to multiple recipients who require different modes of email security. SecureLineTM automatically picks the best secure communications mode for each recipient, based on the information on file, and manages all of the transmission details for you. Our SecureSend portal enables non-users to send secure email messages to SecureLineTM users. SecureLineTM provides an optional password Escrow service whereby users can have the password to their PGP and/or S/MIME security certificates securely saved in case they are lost. In such a case, LuxSci has a procedure in place to authenticate the user so the password can be retrieved. Account administrators can enforce a requirement that their users connect to LuxSci POP, IMAP, SMTP, and WebMail services only over secure connections. This can be configured on a per-user, per-domain, or account-wide basis. Users can import and export SecureLineTM Escrow information and public PGP or S/MIME keys in the address books to and from CSV files. This makes it easy to edit user security data offline and then import it into LuxSci for general use. Use SecureText to send secure text messages to anyone with a cellular number. App Free: The recipient does not need to download or use a special application. 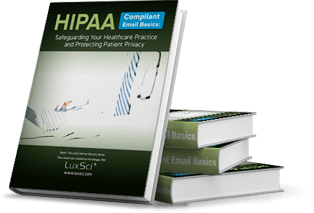 If you have their phone number, you can send them a HIPAA-compliant text without the need for HIPAA consent. They can reply to you securely. It is quick and easy and immediate.